While I think the BBWAA did an outstanding job in choosing the winners of this year's regular season awards, I can always find something to complain about. Today's object of my disfection is your 2010 10th place finisher in the AL MVP voting, Delmon Young. 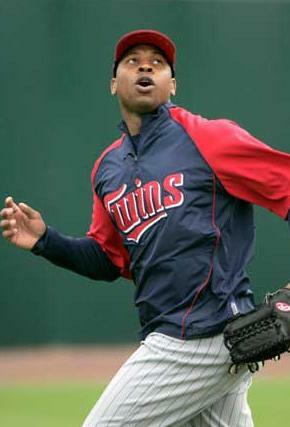 Once upon on time, Young was the first pick overall by the Tampa Bay Rays in 2003. Times were simpler back then. Old School made me pee a little in the movie theater, The O.C. was just getting started, Outkast's Hey Ya wasn't overplayed yet and it wasn't creepy that I was dating an 18-year-old. But the times, they were a changin. In 2007, Young played all 162 games for the Rays and was basically a replacement level player. He hit 13 home runs and a .288/.316/.408 line while playing some pretty good right field but was terrifying in center. Meanwhile, Hollywood crapped out some triquels for us in Spider-Man 3, Shrek The Third and Rush Hour 3. The future looked bleak, my friends. In fact, the Rays would ship off their former top prospect to Minnesota for Matt Garza before the 2008 season. While things picked up for Hollywood in 2008 (Dark Night, The Wrestler), Young was regressing at an alarming pace. Young hit 10 homers and respectable-ish .290/.336/.405 while wondering the Metrodome outfield like a drunken hobo searching for the cans of beer with a sip left in them. His 2008 -19.4 UZR was slightly better than my -26.5 URR (Ultimate Relationship Rating) after I was dumped by a girl for her ex-boyfriend who was recently released from prison. It was a rough year for us both. 2009 was even worse. I moved back to New Orleans, developed a drinking problem, engaged in a highly dysfunctional relationship and lost what seemed like seven hours of my life watching Avatar. Young only managed to make it to the field for 108 games. And that was the highlight of his season. He did pop 12 homers but barely broke a .300 OBP and continued to butcher left field like he was selling deli meat. Which brings us to Young's top ten finish in AL MVP voting in 2010. In full disclosure, I think it's absurd that Young finished tenth and even received a fourth place vote. But Young did seem to turn the corner a little bit at the plate. Young cracked 21 homers and hit .298/.333/.493 good for his career high 2.1 WAR. That 2.1 WAR was good for 45th in the league, inline with Brandon Inge and Marco Scuturo. Thanks to the new stadium, Young did improve his fielding to a near blind-man level. Young wasn't the most valuable outfielder on the Twins (that would be the underrated Denard Span) but every once in a while, you can fall back-asswards into appreciation despite some pretty average work. So if my timeline is matching up with Young's, you should expect to see my nonsensical ramblings in some form of mainstream media in the not too distant future. True story. Why Does Everybody Hate Chase Utley?